RTDAQ/U is an upgrade to the current version of RTDAQ. To be eligible for the upgrade, you must currently own a copy of PC9000 version 5.x. 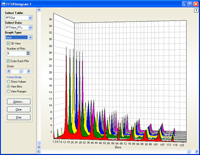 RTDAQ is Campbell Scientific's datalogger support software targeted for high-speed data acquisition applications. Learn more about its capabilities on the RTDAQ product page. RTDAQ/U allows users who currently own a copy of PC9000 version 5.x to upgrade to the most current version of RTDAQ. Learn more about its capabilities on the RTDAQ product page. Required computer operating system is Windows 7, 8, or 10.